Laurel Delaney writes in a tremendous spirit of service to entrepreneurial and small business leaders navigating the opportunities of globalization. Whether leading a fresh startup, a small business, or an entrepreneurial growth company seeking greatness, the question of whether―and how―to go global must be addressed. Delaney shows yet again her passionate dedication to serving her readers with deeply practical guidance. Delaney’s excellent book truly is the definitive guide. It easily and thoroughly explains everything you need to know. If you intend to grow your business beyond the U.S. border, Exporting: The Definitive Guide to Selling Abroad Profitably is a great place to start. 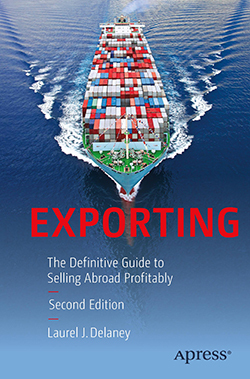 Exporting: The Definitive Guide to Selling Abroad Profitably takes the fear out of going global. It provides a step-by-step roadmap with very detailed and practical advice. From helping to identify markets to developing the relationships necessary for sales and distribution—this book is a must-have for any business trying to expand globally and profitably.